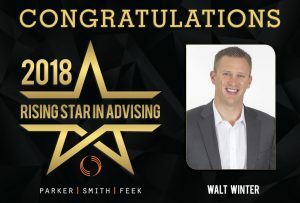 Parker, Smith & Feek, Vice President and Account Executive Walt Winter has been honored as a ‘2018 Rising Star in Advising’ by the Employee Benefit Adviser. Walt manages Parker, Smith & Feek’s Technology Practice Group, assisting companies in providing a benefits package specific to their needs. He specializes in working with companies that have 100-1,000 employees, helping clients to design a multiyear strategy to retain and recruit the best employees while controlling cost and improving the health of employees.